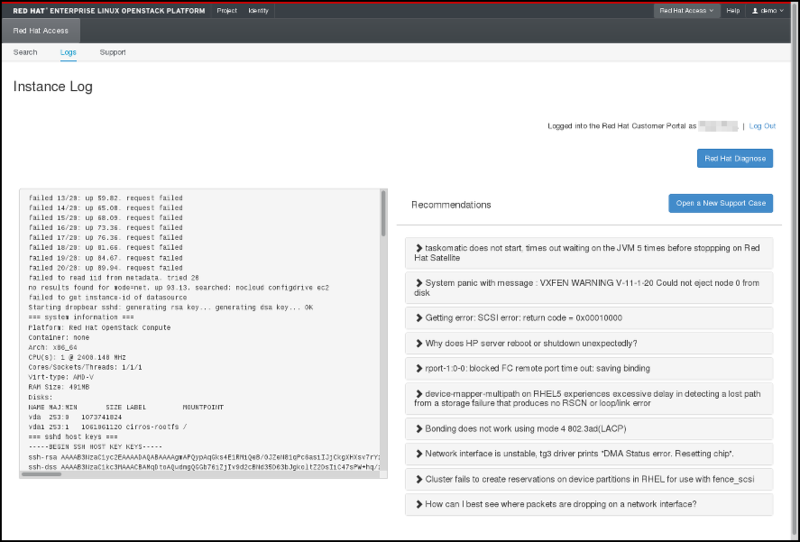 This document provides an overview of the logging and monitoring capabilities that are available in a Red Hat OpenStack Platform environment, and how to troubleshoot possible issues. 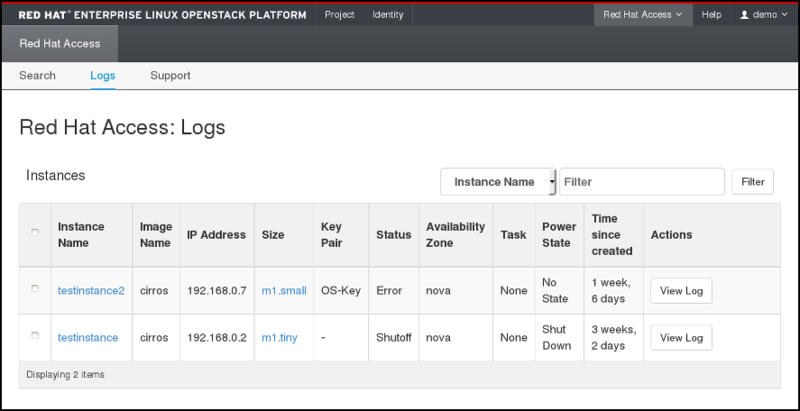 Red Hat OpenStack Platform writes informational messages to specific log files; you can use these messages for troubleshooting and monitoring system events. You do not need to attach the individual log files to your support cases manually. The sosreport utility gathers all relevant information automatically. For more information, see Chapter 6, Troubleshooting. Each OpenStack component has a separate logging directory containing files specific to a running service. There is also /var/log/containers/httpd/default_error.log, which stores errors reported by other web services running on the same host. OpenStack Object Storage sends logs to the system logging facility only. By default, all Object Storage log files to /var/log/containers/swift/swift.log, using the local0, local1, and local2 syslog facilities. The log messages of Object Storage are classified into two broad categories: those by REST API services and those by background daemons. The API service messages contain one line per API request, in a manner similar to popular HTTP servers; both the frontend (Proxy) and backend (Account, Container, Object) services post such messages. The daemon messages are less structured and typically contain human-readable information about daemons performing their periodic tasks. However, regardless of which part of Object Storage produces the message, the source identity is always at the beginning of the line. Some information from the Manila Python library can also be logged in /var/log/containers/manila/manila-manage.log. The following services are used by the core OpenStack components and have their own log directories and files. For more information, see Section 2.3.1, “Configurable parameters”. The following table contains descriptions of the parameters that you can configure. You can find these parameters in the tripleo-heat-templates/puppet/services/logging/fluentd-config.yaml file. Default format used to parse messages from log files. Directory in which to place Fluentd pos_file files. It is used to track file position for the tail input type. Add the Fluentd user to these groups. Override this parameter if you want to modify the default list of groups. Use the LoggingExtraGroups parameter to add the Fluentd user to additional groups. Add the Fluentd user to these groups, in addition to the LoggingDefaultGroups parameter, and the groups provided by individual composable services. A list of Fluentd default filters. This list is passed verbatim to the filter key of a fluentd::config resource. Override this if you do not want the default set of filters. Use the LoggingExtraFilters parameter if you want to add additional servers. A list of additional Fluentd filters. This list is passed verbatim to the filter key of a fluentd::config resource. A boolean value indicating whether or not to forward log messages using the secure_forward plugin. PEM-encoded key for Fluentd CA certificate. The in_secure_forward parameter uses the value in the LoggingSSLKey parameter. PEM-encoded SSL CA certificate for Fluentd. Passphrase for the LoggingSSLKey parameter. The in_secure_forward parameter uses the value in the LoggingSSLKeyPassphrase parameter. Shared secret for Fluentd secure-forward plugin. A list of default logging sources for Fluentd. Override this parameter to disable the default logging sources. Use the LoggingExtraSources parameter to define additional source configurations. This list combines with the LoggingDefaultSources parameter and any logging sources defined by composable services. If you modify the default containers and the modification includes the path to the service log file, you must also modify the default log file path. Every composable service has a <service_name>LoggingSource parameter. For example, for nova-compute service, the parameter is NovaComputeLoggingSource. To override the default path for the nova-compute service, add the path to the `NovaComputeLoggingSource`parameter in your configuration file. Increase the level of informational logging by enabling debugging. This option greatly increases the amount of information captured, so consider using it temporarily or first reviewing your log rotation settings. Options are also available for timestamp configuration and log formatting, among others. Review the component’s configuration file for additional logging options. All OpenStack services generate and update log files. These log files record actions, errors, warnings, and other events. In a distributed environment like OpenStack, collecting these logs in a central location simplifies debugging and administration. For more information about centralized logging, see the Monitoring Tools Configuration guide. Time series database (Gnocchi) is a multi-tenant, metrics, and resource database. It is designed to store metrics at a very large scale while providing access to metrics and resources information to operators and users. This section defines the commonly used terms for the Time series database (Gnocchi) features. A function used to aggregate multiple measures into an aggregate. For example, the min aggregation method aggregates the values of different measures to the minimum value of all the measures in the time range. A data point tuple generated from several measures according to the archive policy. An aggregate is composed of a time stamp and a value. An aggregate storage policy attached to a metric. An archive policy determines how long aggregates are kept in a metric and how aggregates are aggregated (the aggregation method). The time between two aggregates in an aggregated time series of a metric. An incoming data point tuple sent to the Time series database by the API. A measure is composed of a time stamp and a value. An entity storing aggregates identified by an UUID. A metric can be attached to a resource using a name. How a metric stores its aggregates is defined by the archive policy that the metric is associated with. An entity representing anything in your infrastructure that you associate a metric with. A resource is identified by a unique ID and can contain attributes. A list of aggregates ordered by time. The time period for which a metric keeps its aggregates. It is used in the context of archive policy. The Time series database (Gnocchi) stores metrics from Telemetry that designate anything that can be measured, for example, the CPU usage of a server, the temperature of a room or the number of bytes sent by a network interface. The polling.yaml file also specifies the default polling interval of 300 seconds (5 minutes). Currently, Gnocchi uses the Identity service for authentication and Redis for incoming measure storage. To store the aggregated measures, Gnocchi relies on either Swift or Ceph (Object Storage). Gnocchi also leverages MySQL to store the index of resources and metrics. The Time series database provides the statsd daemon (gnocchi-statsd) that is compatible with the statsd protocol and can listen to the metrics sent over the network. To enable statsd support in Gnocchi, you must configure the [statsd] option in the configuration file. The resource ID parameter is used as the main generic resource where all the metrics are attached, a user and project ID that are associated with the resource and metrics, and an archive policy name that is used to create the metrics. All the metrics are created dynamically as the metrics are sent to gnocchi-statsd, and attached with the provided name to the resource ID you configured. You can run Gnocchi through a WSGI service such as mod_wsgi or any other WSGI application. The file gnocchi/rest/app.wsgi provided with Gnocchi allows you to enable Gnocchi as a WSGI application. The Gnocchi API tier runs using WSGI. This means it can be run using Apache httpd and mod_wsgi, or another HTTP daemon such as uwsgi. Configure the number of processes and threads according to the number of CPUs you have, usually around 1.5 × number of CPUs. If one server is not enough, you can spawn any number of new API servers to scale Gnocchi out, even on different machines. By default, the gnocchi-metricd daemon spans all your CPU power in order to maximize CPU utilization when computing metric aggregation. You can use the gnocchi status command to query the HTTP API and get the cluster status for metric processing. This command displays the number of metrics to process, known as the processing backlog for the gnocchi-metricd. As long as this backlog is not continuously increasing, the gnocchi-metricd daemon is able to cope with the volume of metrics. If the number of measure to process is continuously increasing, you might have to temporarily increase the number of the gnocchi-metricd daemons. You can run any number of metricd daemons on any number of servers. MetricProcessingDelay - Adjusts the delay period between iterations of metric processing. GnocchiMetricdWorkers - Configures the number of metricd workers. The /v1/status endpoint of the HTTP API returns various information, such as the number of measures to process (measures backlog), which you can easily monitor. Ensure that the HTTP server and the gnocchi-metricd daemon are running and are not logging warning or error messages to the log. To recover from an unfortunate event, you must back up both the index and the storage. That means creating a database dump (PostgreSQL or MySQL) and taking snapshots or making copies of your data storage (Ceph, Swift, or your file system). You must restore your index and storage backups, re-install Gnocchi if necessary, and restart it. The OpenStack Telemetry service provides usage metrics that can be leveraged for billing, charge-back, and show-back purposes. Such metrics data can be used by third-party applications to plan for capacity on the cluster and can also be leveraged for auto-scaling virtual instances using OpenStack Heat. For more information, see Auto Scaling for Instances. The combination of ceilometer and gnocchi can be used for monitoring and alarms. This is supported on small-size clusters and with known limitations. For real-time monitoring, Red Hat OpenStack Platform ships with agents that provide metrics data, and can be consumed by separate monitoring infrastructure and applications. For more information, see Monitoring Tools Configuration. Where START_TIME and END_TIME are in the form iso-dateThh:mm:ss. This example shows the average memory usage of all instances for each project. If your Intel hardware and libvirt version supports Cache Monitoring Technology (CMT), you can use the cpu_l3_cache meter to monitor the amount of L3 cache used by an instance. cmt in the LibvirtEnabledPerfEvents parameter. cpu_l3_cache in the gnocchi_resources.yaml file. cpu_l3_cache in the Ceilometer polling.yaml file. Create a YAML file for telemetry (for example, ceilometer-environment.yaml) and add cmt to the LibvirtEnabledPerfEvents parameter. Launch the overcloud with this YAML file. Verify that cpu_l3_cache is enabled in gnocchi on the Compute node. Verify that cpu_l3_cache is enabled for Telemetry polling. If cpu_l3_cache is not enabled for Telemetry, enable it, and restart the service. # docker exec -ti ceilometer_agent_compute pkill -HUP -f "ceilometer. *master process"
This docker change does not persist over a reboot. After you launch a guest instance on this compute node, you can use the gnocchi measures show command to monitor the CMT metrics. The following example demonstrates how to use an Aodh alarm to monitor the cumulative disk activity for all the instances contained within a particular project. 2. Use the project’s UUID to create an alarm that analyses the sum() of all read requests generated by the instances in the admin tenant (the query can be further restrained with the --query parameter). In this result, the metrics value lists the components you can monitor using Aodh alarms, for example cpu_util. archive_policy - Defines the aggregation interval for calculating the std, count, min, max, sum, mean values. comparison-operator - The ge operator defines that the alarm will trigger if the CPU usage is greater than (or equal to) 80%. granularity - Metrics have an archive policy associated with them; the policy can have various granularities (for example, 5 minutes aggregation for 1 hour + 1 hour aggregation over a month). The granularity value must match the duration described in the archive policy. evaluation-periods - Number of granularity periods that need to pass before the alarm will trigger. For example, setting this value to 2 will mean that the CPU usage will need to be over 80% for two polling periods before the alarm will trigger. [u’log://'] - This value will log events to your Aodh log file. You can define different actions to run when an alarm is triggered (alarm_actions), and when it returns to a normal state (ok_actions), such as a webhook URL. Telemetry resource types that were previously hardcoded can now be managed by the gnocchi client. You can use the gnocchi client to create, view, and delete resource types, and you can use the gnocchi API to update or delete attributes. You cannot delete a resource type if a resource is using it. This chapter contains logging and support information to assist with troubleshooting your Red Hat OpenStack Platform deployment. If client commands fail or you run into other issues, contact Red Hat Technical Support with a description of what happened, the full console output, all log files referenced in the console output, and an sosreport from the node that is (or might be) in trouble. For example, if you encounter a problem on the compute level, run sosreport on the Nova node, or if it is a networking issue, run the utility on the Neutron node. For general deployment issues, it is best to run sosreport on the cloud controller. 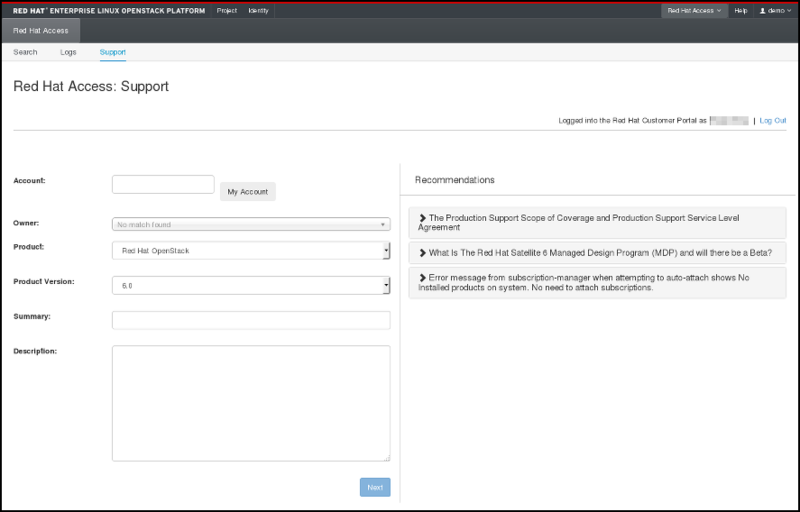 For information about the sosreport command (sos package), refer to What is a sosreport and how to create one in Red Hat Enterprise Linux 4.6 and later. Check also the /var/log/messages file for any hints. If the service is not active then log in as the root user and start it. The firewall might not be configured to allow TCP traffic on ports 5000 and 35357. If so, see Managing the Overcloud Firewall in the Advanced Overcloud Customization guide for instructions on checking your firewall settings and defining custom rules. On the system hosting the Identity service, check that the endpoints are defined correctly. Replace IP with the IP address or host name of the system hosting the Identity service. Replace VERSION with the API version (v2.0, or v3) that is in use. Verify that the listed publicurl, internalurl, and adminurl for the Identity service are correct. In particular, ensure that the IP addresses and port numbers listed within each endpoint are correct and reachable over the network. Replace TOKEN and ENDPOINT with the values identified previously. Replace ID with the identity of the endpoint to remove as listed by the endpoint-list action. This section discusses the different commands you can use and procedures you can follow to troubleshoot the OpenStack Networking service issues. Use the ip a command to display all the physical and virtual devices. Use the ovs-vsctl show command to display the interfaces and bridges in a virtual switch. Use the ovs-dpctl show command to show datapaths on the switch. Use the tcpdump command to see where packets are not getting through. Replace INTERFACE with the name of the network interface to see where the packets are not getting through. The interface name can be the name of the bridge or host Ethernet device. The -e flag ensures that the link-level header is dumped (in which the vlan tag will appear). The -w flag is optional. You can use it only if you want to write the output to a file. If not, the output is written to the standard output (stdout). For more information about tcpdump, refer to its manual page by running man tcpdump. Use the ip netns list command to list all known network namespaces. Use the ip netns exec command to show routing tables inside specific namespaces. Start the ip netns exec command in a bash shell so that subsequent commands can be invoked without the ip netns exec command. The Networks and Routers tabs only appear in the dashboard when the environment is configured to use OpenStack Networking. In particular, note that by default the PackStack utility currently deploys Nova Networking and as such in environments deployed in this manner the tab will not be visible. If OpenStack Networking is deployed in the environment but the tabs still do not appear, ensure that the service endpoints are defined correctly in the Identity service, that the firewall is allowing access to the endpoints, and that the services are running. When using the dashboard to launch instances if the operation fails, a generic ERROR message is displayed. Determining the actual cause of the failure requires the use of the command line tools. Use the nova list command to locate the unique identifier of the instance. Then use this identifier as an argument to the nova show command. One of the items returned will be the error condition. The most common value is NoValidHost. This error indicates that no valid host was found with enough available resources to host the instance. To work around this issue, consider choosing a smaller instance size or increasing the overcommit allowances for your environment. To host a given instance, the compute node must have not only available CPU and RAM resources but also enough disk space for the ephemeral storage associated with the instance. django_openstack_auth is a pluggable Django authentication back end, that works with Django’s contrib.auth framework, to authenticate a user against the OpenStack Identity service API. Django_openstack_auth uses the token object to encapsulate user and Keystone related information. The dashboard uses the token object to rebuild the Django user object. In some cases, particularly when a signed cookie session back end is used and, when having many or all services enabled all at once, the size of cookies can reach its limit and the dashboard can fail to log in. One of the reasons for the growth of cookie size is the service catalog. As more services are registered, the bigger the size of the service catalog would be. In such scenarios, to improve the session token management, include the following configuration settings for logging in to the dashboard, especially when using Keystone v3 authentication. Connect to the database service using the mysql command. Replace USER with the username of the user that you want to connect to. The USER must be a root user (or at least as a user with the correct permission: create db). You do not need to create a superuser, so answer 'n' to the question. 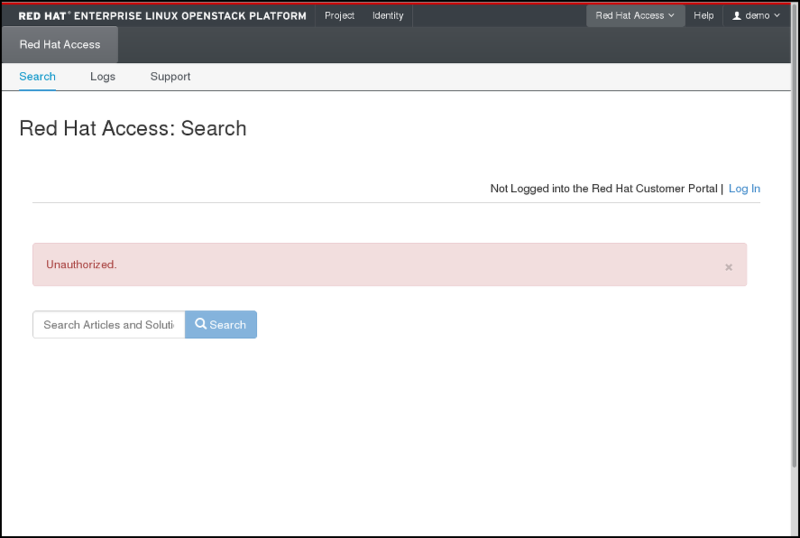 The Red Hat Access tab, which is part of the OpenStack dashboard, allows you to search for and read articles or solutions from the Red Hat Customer Portal, view logs from your instances and diagnose them, and work with your customer support cases. Figure 6.1. Red Hat Access Tab. 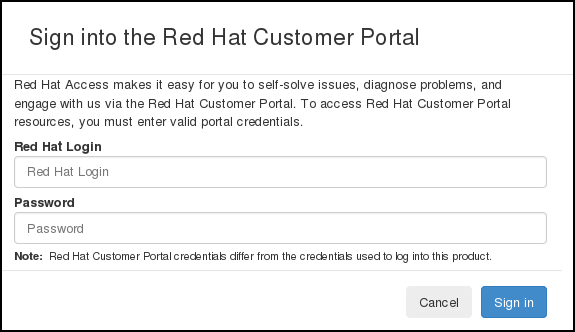 You must be logged in to the Red Hat Customer Portal in the browser to use the functions provided by the Red Hat Access tab. Enter your Red Hat login. Enter your Red Hat password. Figure 6.2. Logging in to the Red Hat Customer Portal. If you do not log in now, you will be prompted for your Red Hat login and password when you use one of the functions that require authentication. Figure 6.3. 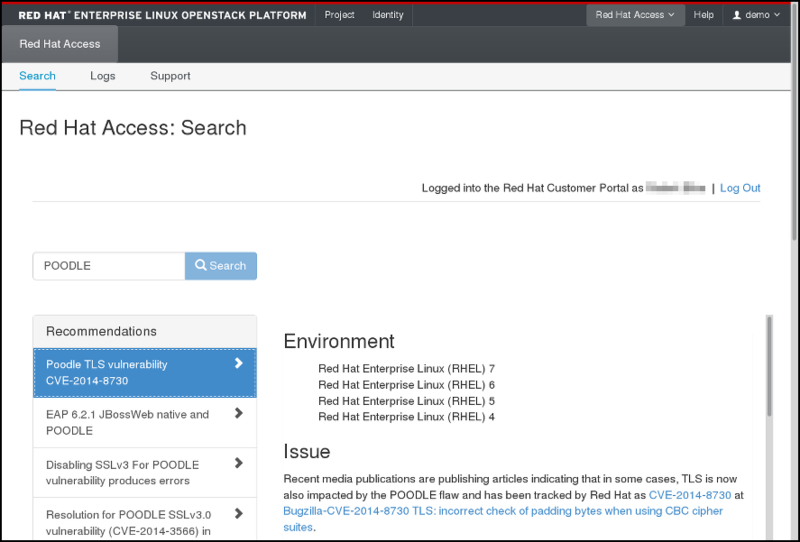 Example of Search Results on the Red Hat Access Tab. Figure 6.4. Instance Logs on the Red Hat Access Tab. Find the instance of your choice in the table. If you have many instances, you can filter them by name, status, image ID, or flavor ID. Click View Log in the Actions column for the instance to check. Figure 6.5. Instance Logs on the Red Hat Access Tab. If none of the recommendations are useful or a genuine problem has been logged, click Open a New Support Case to report the problem to Red Hat Support. Figure 6.6. Search for Support Cases. Figure 6.7. Open a New Support Case.